Slaughterhouse workers earn more in Nebraska. Coastal North Carolina has the greatest number of workers. And southeast Mississippi workers earn the least. An interactive data set explores the width and breadth of slaughterhouse employment in America. Meat processing is a major employer in rural America, but the number of jobs, the pay and the percentage of workers employed in the industry vary greatly by region. 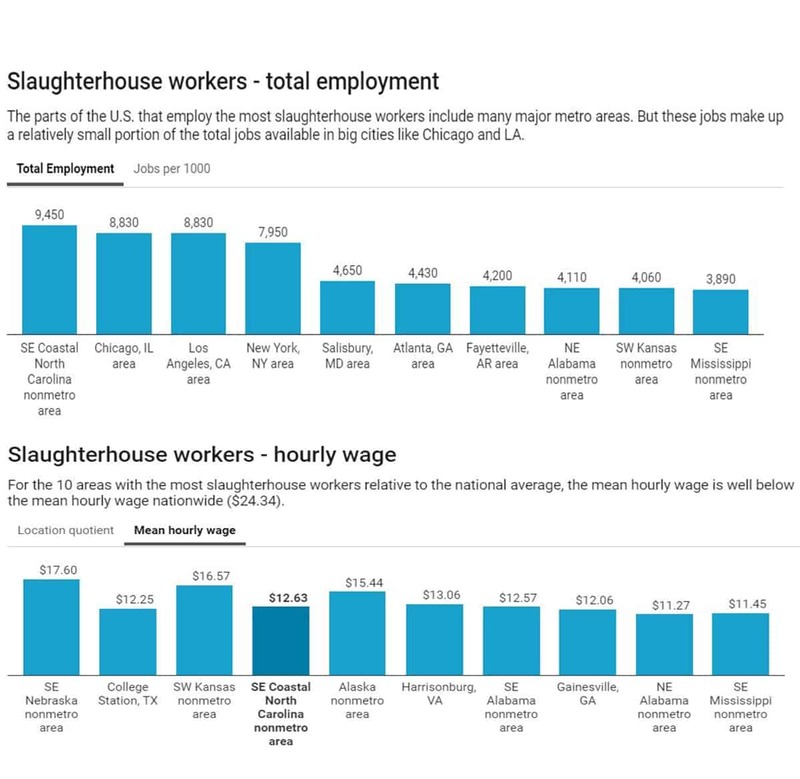 The Midwest Center for Investigative Reporting has published a trove of interactive graphics exploring slaughterhouse employment in the U.S. The graphs show just how important the industry is to rural workers and how that line of work compares to other rural employment. And it offers a chance to compare the employment levels and pay rates of slaughterhouse workers across different regions. 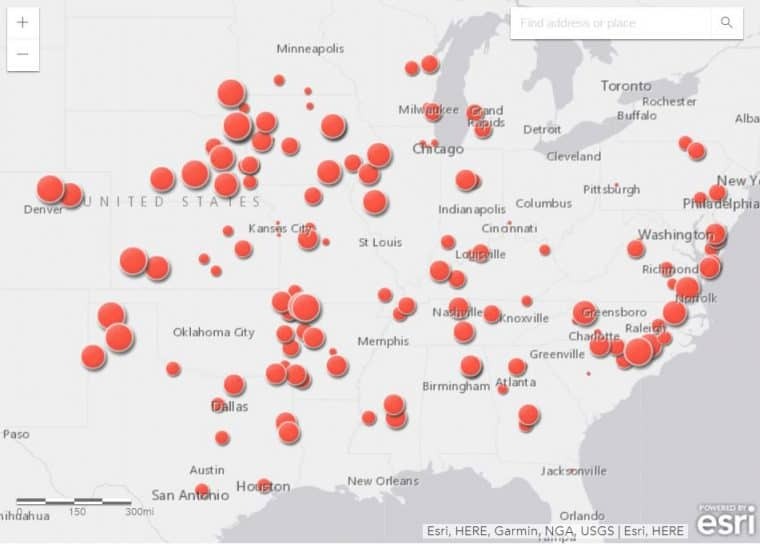 The size of the red dotes corresponds to the relative number of slaughterhouse workers at a given location. For an interactive version of the map, visit the Midwest Center for Investigative Reporting. Note: The BLS classifies “butchers and other meat, poultry, and fish processing workers” into three detailed occupations: (1) butchers and meat cutters, (2) Meat, Poultry, and Fish Cutters and Trimmers, and (3) Slaughterers and Meat Packers. The below analysis aggregates data from these three occupations. Coastal North Carolina is the region with the largest number of slaughterhouse workers in the nation (9,450). But southwest Kansas has the highest rate of slaughterhouse employment (27.1 per 1,000 compare to coastal North Carolina’s 12.7). Rural Nebraska offers the highest average wages for slaughterhouse workers ($17.60 an hour), of the top 10 locations with the highest number of slaughterhouse workers compared to the national average. Even if the slaughterhouse economy isn’t your thing, the graphs provide some rich detail on where rural Americans work, what they make, and how they fare compared to other regions. And it reminds us that rural data at the national level can hide important regional differences that have everything to do with the quality of life people enjoy there. Take a look.